Very Clean with Low Miles. Must See to Appreciate. Clean CARFAX. Remote Start, Bluetooth Hands Free, 4X4, Vortec 5.3L V8 SFI VVT Flex Fuel, 22" Chrome 6-Spoke Wheels, 6" Tubular Oval Chrome Assist Steps, AM/FM Stereo w/MP3 Compatible CD Player, Bed Liner, Bed-Mounted Tie-Down Hooks, Bedrail Protectors, Dual-Zone Automatic Climate Control, Heavy-Duty Handling/Trailering Suspension Package, Off-Road Suspension Package, On The Job Package, Remote Vehicle Starter System, SiriusXM Satellite Radio, Skid Plate Package, Universal Home Remote. 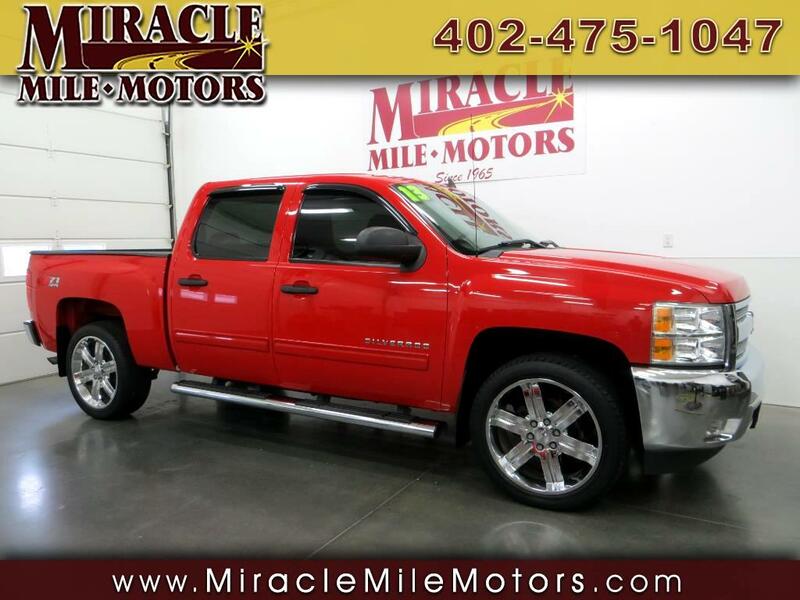 2013 Chevrolet Silverado 1500 LT 4D Crew Cab 6-Speed Automatic Electronic with Overdrive 4WD Vortec 5.3L V8 SFI VVT Flex Fuel Miracle Mile Motors in Lincoln NE have been in business for over 50 years selling premium quality used cars, trucks and SUV's vehicles. We are committed to save you time and money and make your buying experience hassle free and pleasurable. All of our prices are clearly displayed on each vehicle. We offer bank financing , service contracts, and Carfax reports. NO DOCUMENTATION OR HIDDENS FEES. Word of mouth is our best advertising. Please look thru our inventory at www.miraclemilemotors.com or e-mail with any questions. 1-888-465-8963 87th & Hwy 2 Lincoln, NE 68526 Where Friends Tell their Friends to Buy CarS. Recent Arrival! Odometer is 38199 miles below market average!